Globally, 23% of political leadership positions are held by women. 24% of senior business positions are held by women. In Fortune 500 companies, 5% have female CEO’s. Women make up 29% of individuals who run their own company. There has been huge progress in gender equality in the workplace. The statistics around women & men working is close to 50%. But when it comes to leadership positions, there is still much progress to be made. 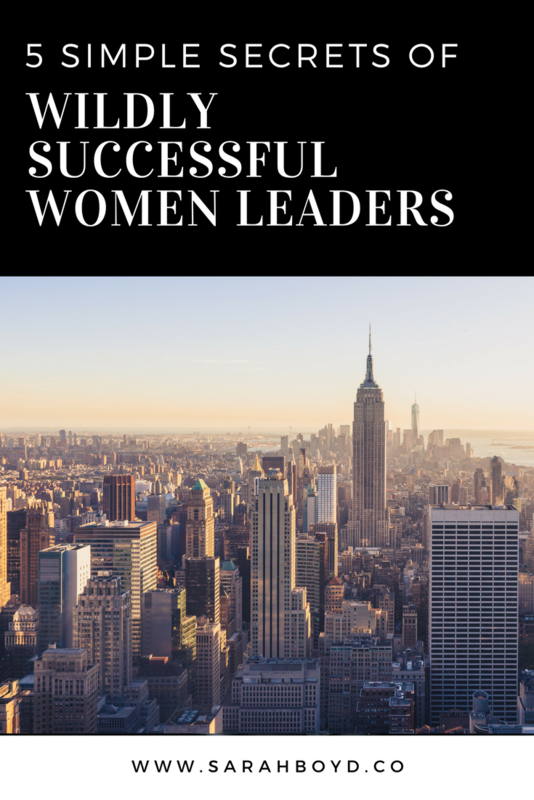 In today’s episode we’re talking about 5 Simple Secrets of Wildly Successful Women Leaders. It’s no secret that we still have further progress to make in relation to gender equality in leadership. Whether you’re wanting to lead your own company or rise into the C-suite of an organisation, gender can be a complex issue. The five areas below are areas that you can take personal responsibility for & see change. Successful women leaders put themselves in the game. Sheryl Sandberg, author of “Lean In”, talks about this as ‘leaning into the opportunity’, or ‘taking a seat at the table’. Having a positive mindset is about making sure that you are in the game, you are lifting your voice to make sure it’s heard. It is about confidently owning your space. Living outside of your comfort zone comes with a degree of fear, uncertainty & resistance. But expansion does not happen without this stretch. Successful women leaders are committed to this stretch. Most successful leaders that are making a significant difference in the world have had to overcome personal adversity. It’s not gift, talent, knowledge or IQ that determines success; but your ability to stick at something & overcome obstacles that may come. This is particularly true for women who are pioneering leadership in communities or environments where women in leadership hasn’t been the norm. This type of pioneering requires a deeper sense of perseverance, resilience & inner strength. A new study has found that senior executive women have a significantly higher emotional intelligence that their male counterparts. This gave them the advantage in areas of influence and conflict management. Emotional intelligence is the ability to read your own emotions & respond intelligently; & to do the same with others. If you’re wanting to make a significant impact in your workplace & lead people to new levels then you need to continually increase your emotional intelligence. Successful women leaders are aware that environments and other people’s energy can help them rise or shrink from possibility. They take responsibility for placing themselves around people & in environments that lift them up. As you pioneer new paths as a women in leadership, remember you’re making a difference. It’s not just making a difference for your own personal desires, or even for your own company, but you’re breaking glass ceilings. You’re showing someone else what is possible. Other younger women are watching you & seeing a new model of life & leadership. What do you believe is the key for successful leadership as a woman?